Famed for gargantuane-scaled sculptures, British art scene stalwart Anish Kapoor does the unthinkable and unveils covetable scale models small enough for pilfering hands. Close your left eye. Close it tight. Just the one. Keep the right open. It’s the left you must shut, closing off half the world. Focus on the right side. And just look. Even like this, with depth perception stunted at the source, and baked-potato Technicolor film around your suddenly strained iris making soft-focus asides of what is in front of you, even like this, Anish Kapoor’s public works of enormo-sculpture remain unimaginable, indigestible: too large to look at. As a result this is work that needs to experienced. It needs all the elements. You can’t look at one of Kapoor’s gargantuan silver artefacts: you must taste it with the fats of your fingers. Smell the sickly must of pigeon-sweat and man hours that has gone into manufacturing it. You must hold it, and, for those brief seconds you have it skin-on-skin, become it. You walk through it. You exist beside it. The viewer is enveloped. The viewer is overwhelmed. The viewer is consumed. Kapoor’s work was not meant to merely be looked at. 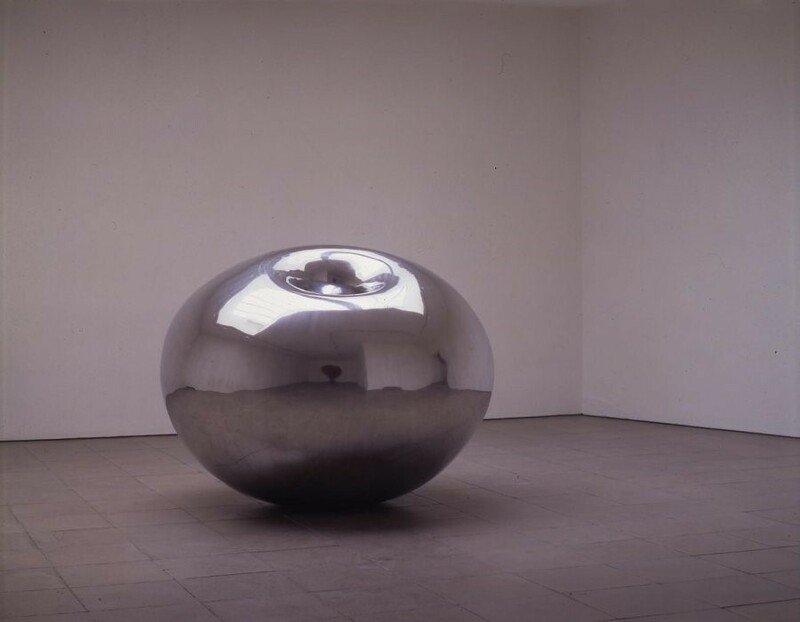 In the early 1980s, Kapoor emerged as one of a number of British sculptors working in a new style: frequently simple, curved forms, usually monochromatic and brightly coloured. Most often, the intention was to engage the viewer, evoking mystery through the works' dark cavities, awe through their size and simple beauty, tactility through their inviting surfaces and fascination through their reflective facades. One of his first public pieces was a 35 metre-tall piece installed in the Baltic Flour Mills in Gateshead. Kapoor began as he meant to go on: large-scaled. "Think big" may as well have been his motto du jour. How odd then, that the master of grandiose has chosen to take a different approach to his latest exhibit: architectural scale models. To clarify: models no larger than a desk lamp. The Royal Institute of British Architects (RIBA) presented this month Place. No Place: Anish Kapoor in Architecture, an exhibition which surveys the artist’s close collaboration with architects and engineers over the last twenty five years. It goes without saying that the exhibition allows for an entirely different experience from any other show by Kapoor. "This show is important because I wanted people to understand the story behind the sculptures," says Kapoor. "I’m very much studio-based. I employ a few people, because you can’t do it all yourself, but the studio is all; every problem, every issue is here. I can’t solve them in a plane or in my head and I don’t believe that an intellectual practice is enough. Maquettes are an essential tool, because drawings alone just don’t explain it. These models tell the viewer this story. They explain these things that the finished product does not." The show includes structural sets and pared down replicas of famous works - included in the exhibition are models for Taratantara at the Baltic, created with Neil Thomas of Atelier One (1999), the Salvation Army Visitor Centre with John McAslan and Partners (2001), the design for two Naples subways with Jan Kaplicky and Future Systems (2003) - most of which have never been displayed before, which offer a rare insight into many of Anish Kapoor’s major international projects that have seemed so unattainable, so unapproachable when looked at as wholes. "This show isn’t exactly different to my other showcases. They have the same ethos. Scale aside, I’m always returning to a similar set of problems about our body’s relation with things in space, but the challenge of the work is that it needs to confound expectations. It also has to do with the sense that an object is only of real significance when it has an immaterial counterpoint, so it’s the materiality and beyond. It doesn’t matter if it is presented as a scale model or the finished piece," Kapoor says. But size, in the end, does, as they say, matter? "At some levels scale has a bad name in sculpture, but it’s an integral tool when dealing with space. My work is not architecture, but can be architectural in scale. The models [currently on show at RIBA] are of 40 quasi-architectural projects since 1984 and I’ve been deeply interested in this moment where sculpture creates another reading of space for the past 20 years," Kapoor concludes. "They celebrate the scale that has dominated in my past shows, but are minimal in scale themselves. So, even though they are small, they are still championing what it is I am famed for: size!" Place. No Place: Anish Kapoor in Architecture exhibited at the RIBA.